Gross Domestic Product or GDP is an economic indicator that is compiled and released by the U.S. Bureau of Economic Analysis. Calculating GDP is no small task, as it attempts to calculate the total market value of all goods and services produced over some finite period (quarterly and yearly). GDP is important because it is the ultimate score card for an economy. If growth is too slow or negative, the government may implement fiscal and monetary policies to help stimulate the economy (cut taxes, increase government spending, lower interest rates, etc.). If growth is too fast, and inflation starts to up-tick, the Federal Reserve can conduct open market operations to raise interest rates in at attempt to choke off liquidity and slow things down. GDP is what is known as a lagging indicator. Although it does a good job at telling us where the economy has been, it tells us very little about the current situation. 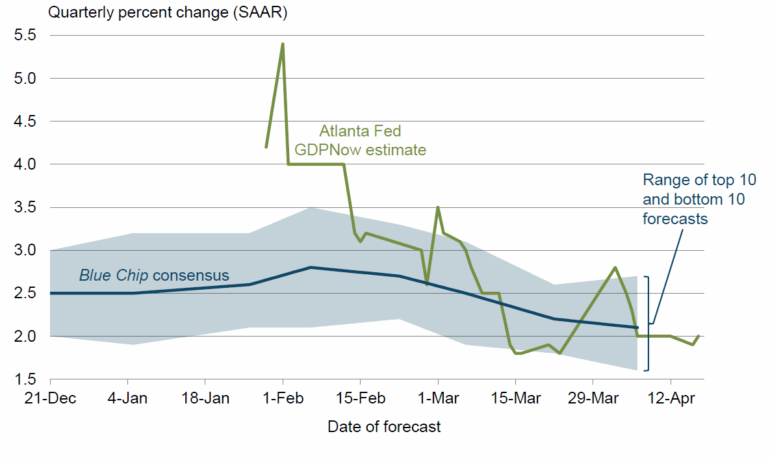 With that in mind, the Atlanta branch of the Federal Reserve has developed a “nowcast” of GDP called “GDPNow”, which attempts to provide a timely estimate of GDP for the upcoming quarter. Each week, the Atlanta Fed adjusts their forecast as data becomes available (the model improves in accuracy as it approaches the end of the quarter). For the period ending April 17th, 2018, GDPNow is “nowcasting” first quarter GDP growth of just 2%. You can see in the chart below that GDPNow estimates have steadily fallen since early February when the model peaked at 5% + growth. Although first quarter GDP has been noticeably weak in recent years, some fear that Trump’s economic policies may not have as much “punch” as previously thought.